The new Zaans Medical Centre is a people-focused, welcoming and innovative hospital. A lot of attention has been paid to providing positive distraction for patients and visitors. Part of this healing environment are the environmental graphics created by SILO Agency together with Mecanoo. This work receives worldwide attention and has been awarded major design and innovation prizes in London and New York. SILO combined technique and design to create striking graphical elements throughout the hospital that provide a positive distraction. Using 3D software and animation models, a total of 3,500m2 of hand-drawn illustrations are featured on walls, glass walls and lifts. 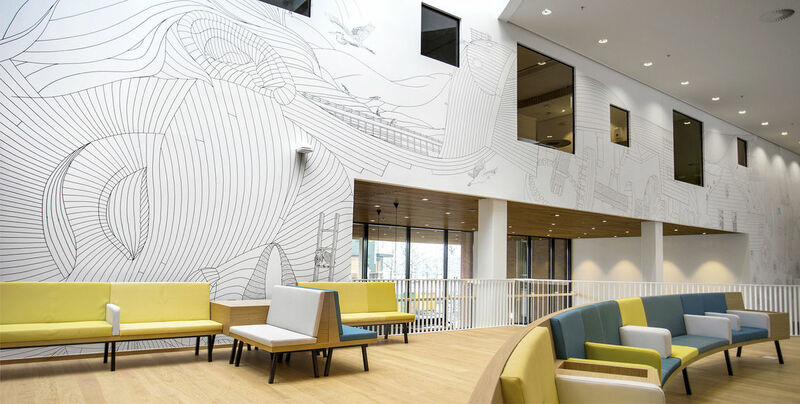 All hand-drawn illustrations on the walls are applied with Vescom's langor+print. The representation in the central hall consists of the human body, composed of components of the industrial history of Zaandam, elements the all citizens of the region are familiar with.